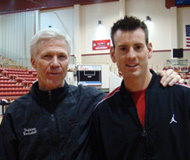 Billy’s Davidson College Coach earned Coach of the Year for the 11th time in the Southern Conference. Congrats to Coach McKillop and the Wildcats on a great season so far. Help us cheer them on as they prepare for March Madness!